Gaiam's Core Power Yoga Calorie Blast DVD & Sage Lily Yoga Mat. Photos courtesy of Gaiam. This post has been sponsored by Gaiam. Mother nature is all around us, and in today’s world, taking care of her is extremely important. More and more, we are seeing products that help you to live a “green” life. Here at CupidsPulse.com, we love promoting healthy living – which is why we’re so excited about Gaiam yoga products. Not only do they help you find your inner goddess, but they make you proud of living a healthy lifestyle. Gaiam, pronounced “guy-um,” is a fusion of words that means “I am Mother Earth.” The word Gaiam represents planetary awareness, preservation and support of the interconnectivity of all living things. Being connected is important, whether it be with the environment, with yourself or with that special someone. So for all of you ladies out there who value the world, a healthy lifestyle and personal development, we have some great finds for you. Gaiam’s Sage Lily Yoga Mat, a five-millimeter PVC mat, is created with you in mind. This tranquil and serene mat is absolutely gorgeous with a fresh design of lilies and relaxing color palette. No matter where you practice yoga, this mat will make you feel fresh, comfortable and unique. Use this product as a way to revamp your current workout or even start a new hobby with your guy. Are you looking for some guidance during your at-home workouts? 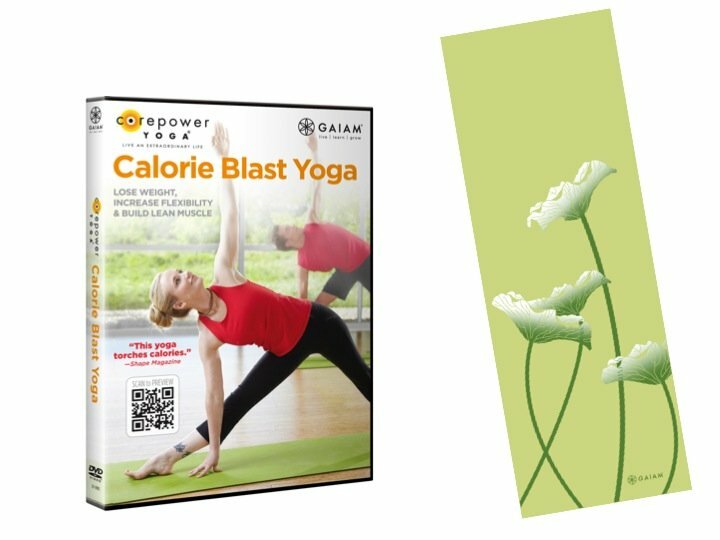 Gaiam’s Core Power Yoga Calorie Blast DVD is the perfect fit for you. Core Power Yoga is the hottest in-studio practice, and this brand new DVD includes three ultra-efficient toning and fat-burning yoga workouts. You can work up a sweat and spark your metabolism with your beau in the comfort of your own home. It’s a sure-fire way to transform your body from the inside out, ensuring that you feel incredible about yourself! Another Gaiam product that we can’t get enough of is the Adjustable Strap Tank. With it’s sweetheart neckline, adjustable straps and built-in shelf bra, it offers you maximum comfort and support during your workouts. Plus, it’s created from recycled polyester, making it incredibly soft, wrinkle resistant and eco-friendly. Whether you’re practicing Vinyasa, Bikram or Hatha yoga, this tank will ensure that you get the most out of your time on the mat. Now, one lucky CupidsPulse.com reader will have the opportunity to win their very own Sage Lily Yoga Mat and Core Power Yoga Calorie Blast DVD. Be in touch with your inner self – and your man! – and stay fit with Gaiam yoga products. GIVEAWAY ALERT: To enter for a chance to win the Sage Lily Yoga Mat and Core Power Yoga Calorie Blast DVD, go to our Facebook page and click “like.” Leave a comment under our giveaway post letting us know that you want to enter the contest and why you enjoy doing yoga. We will contact the winner via Facebook when the contest is over, and they will have three days to respond back with their contact information. The deadline to enter is 5:00 p.m. EST on Monday, April 1st. Good luck! At Gaiam, they believe that by nurturing, protecting and respecting our planet, its natural resources and its inhabitants, we enrich our own lives and those of future generations. We couldn’t agree more!